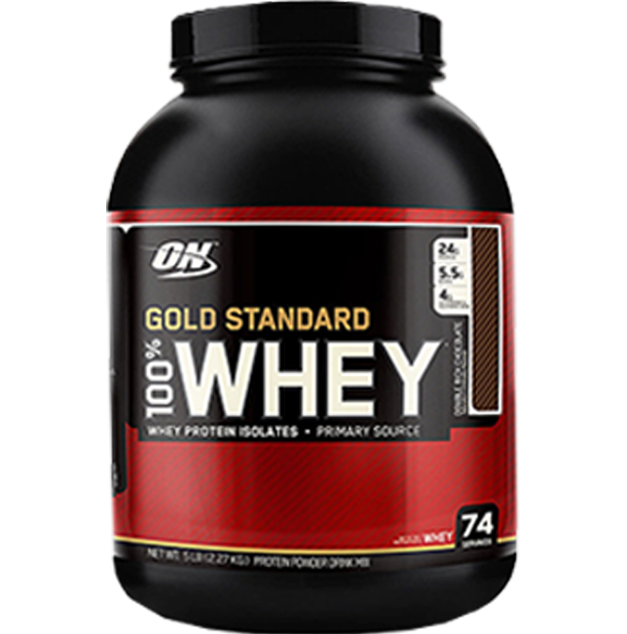 Optimum Nutrition 100% Whey Gold Standard is one of the top selling proteins, if not the best seller, on the market. While other proteins come and go, GoldStandard has managed to hold onto this crown for a number of years. This would have been a very difficult feat if Optimum Nutrition were unable to back things up with a great formulation based on quality ingredients. What is it about Optimum Nutrition 100% Whey Gold Standard that makes it number one? Quality and simplicity are two words that sum up this product. 100% Gold Standard is a product that is free from unnecessary fillers and additives, is low on the fats and carbs, and clocks in at close to 80% pure protein. 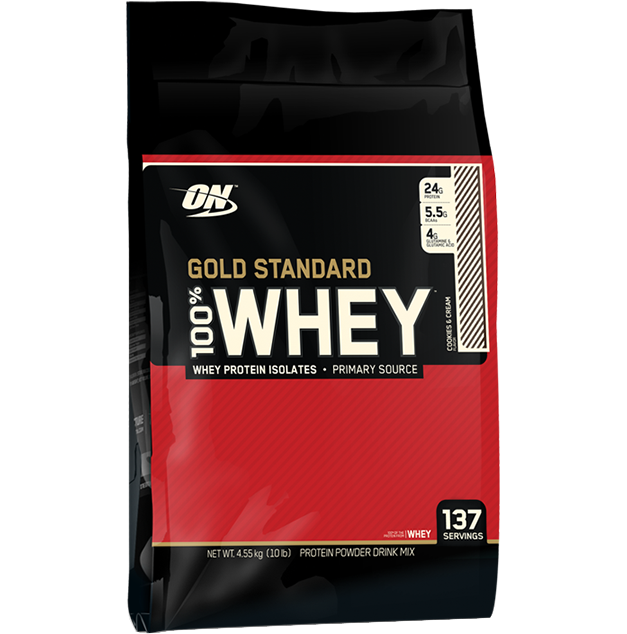 Gold Standard is a blended whey protein. Whey is, without a doubt, the protein of choice for people trying to gain muscle. It is a complete protein, meaning it contains all the essential amino acids. It is digested and absorbed well, and quickly, which makes it ideal for athletes needing an instant hit of protein. Whey is all natural, and like casein, it comes from milk. It was originally a byproduct of cheese manufacture, but was quickly adopted by the food and supplement industries when its nutritional properties were realised. BCAAs, or branched chain amino acids, are vital to the recovery, repair, and growth of muscle tissue, and whey is one of the richest natural sources. Each 30g serving of 100% Whey Gold Standard contains a whopping 5.5g of BCAAs, along with more than 4g of glutamine, another vital muscle building amino acid that can also boost the immune system. Whey can be processed in a variety of ways, which have an impact both on the purity and rate at which it is used by the body. Whey Protein Isolate is the major form of whey in this product. It is the purest form of whey available. This purification process can break down some of the protein structure which means it is absorbed very quickly. The process of making whey protein isolate removes nearly 100% of the fat and carbs, meaning that it is a very efficient way to obtain protein, and great for those people on low carb and low fat diets. An added bonus is that whey protein isolate is pure enough to be almost lactose-free, so people with a mild lactose intolerance may still be able to enjoy Optimum Nutrition Whey Gold. Whey Protein Concentrate is the most commonly found form of whey. It is subject to less rigorous purification than Whey Protein Isolate, which gives it a number of different properties. Slower digestion is possibly the most significant of these. Whey concentrate is still a rapidly digested protein, but due to the presence of other milk components like sugars and lipids, and less breakdown of the original protein structure compared to a whey isolate or hydrolysate, it takes longer to break down. This means valuable muscle building amino acids are slowly "drip-fed" to the body over a longer time period, ensuring the body does not go without nutrients. Because of the less rigorous processing, whey concentrate is a cheaper ingredient than isolate, even though it quite often contains high levels of protein. Whey concentrate is a great ingredient because it is a high quality product that lowers the price and broadens the spectrum of the protein. The final type of whey in 100% Whey Gold Standard is in the form of peptides. Peptides are very small fragments of protein formed through the breakdown of whey protein isolate. Peptides resemble the form that proteins are naturally broken down to within the digestive system, and these pre-digested fragments of protein are absorbed into the body faster than whey protein isolate, and faster even than individual amino acids. The inclusion of peptides ensures that whey gold standard is immediate and starts delivering protein to the muscles as soon as it is drunk. Optimum nutrition have minimised the amount of additives in Gold Standard 100% Whey, sticking only to the most necessary inclusions. These include lecithin, a naturally occurring fatty substance from plants that helps keep the protein mixed and flowing, Acesulfame potassium, which is a sugar-free sweetener, and any one of the sixteen flavours that make up the largest flavour range of any international protein brand. While the formula has had a number of tweaks over the years, most notably in the early years, to keep in step with the rapidly evolving technology in the world of protein manufacture, Gold Standard 100% whey is a solid, dependable product that has remained immune to market fads and trends. Optimum Nutrition look certain to be selling this quality product for many years to come.